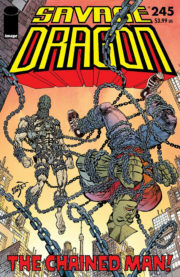 Savage Dragon #236 came out in July 2018. This issue focuses on Dragon’s kids and if the coverfont isn’t a giveaway this issue pays homage to one of the greatest cartoons ever: Bill Watterson’s Calvin & Hobbes. The book features 5 spreads in the style of classic Sunday funny pages. Added complications included having to avoid the center of pages with text (because of possible alignment issues) and making sure all spreads were clearly spreads, which meant at least one panel had to clearly cross over from one page to the next–in this case panel four. Erik roughly based the panel configuration of the above spread on an actual Calvin and Hobbes Sunday strip. 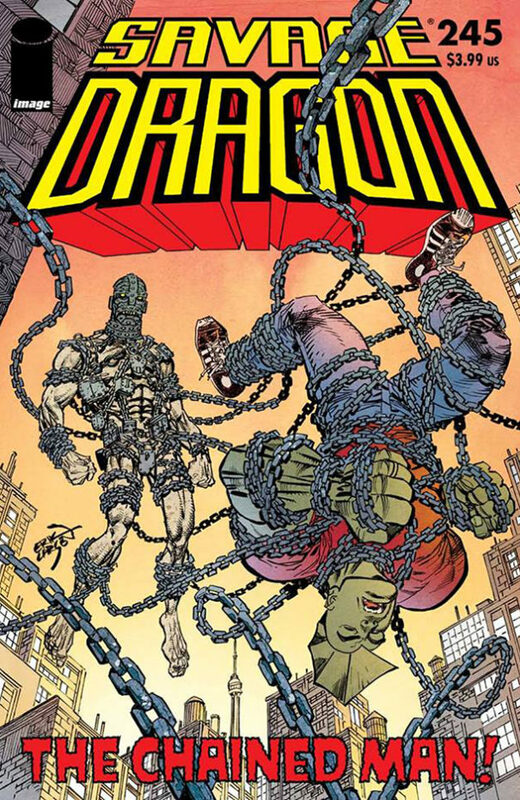 In addition to the familiar panel layouts, it is Ferran Delgado’s great handling of the fonts and lettering that make these pages work so well. 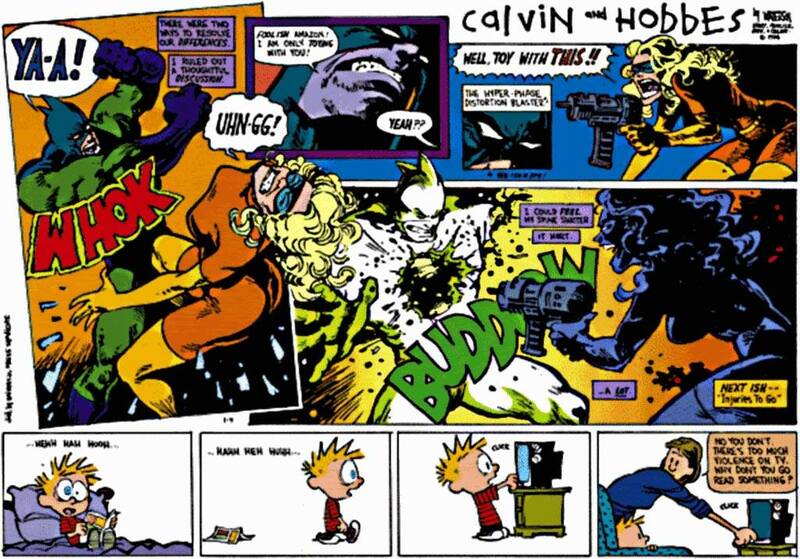 Ferran also suggested to run a little caption at the start of the issue to point out the connection to Calvin & Hobbes but in the end it wasn’t used and I don’t think it’s really necessary. Ferran had suggested running THIS caption on the splash. I explained that I thought it would be weird to credit Bill given that I didn’t exactly nail his style or tell actual funny jokes. I do a very mild Watterson imitation. Just similar panel arrangements (most aren’t the same as actual Sunday pages) and lettering. There are no Calvin or Hobbes type characters in the mix. 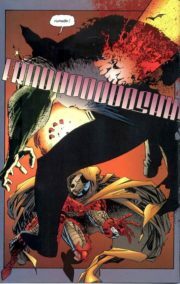 I figure that readers will either get what I’m doing or not. 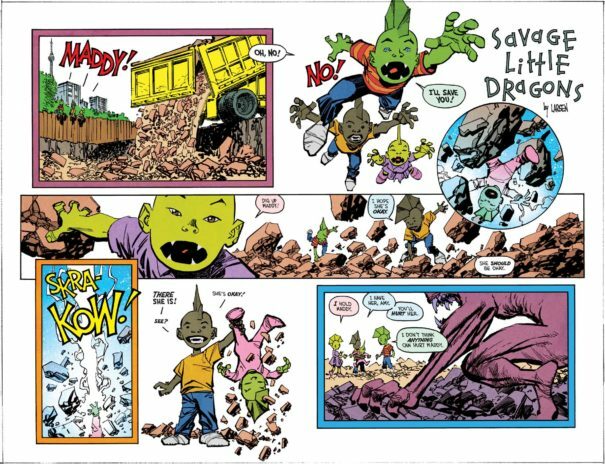 I always wondered if this Calvin and Hobbes Sunday page had been inspired by Savage Dragon. 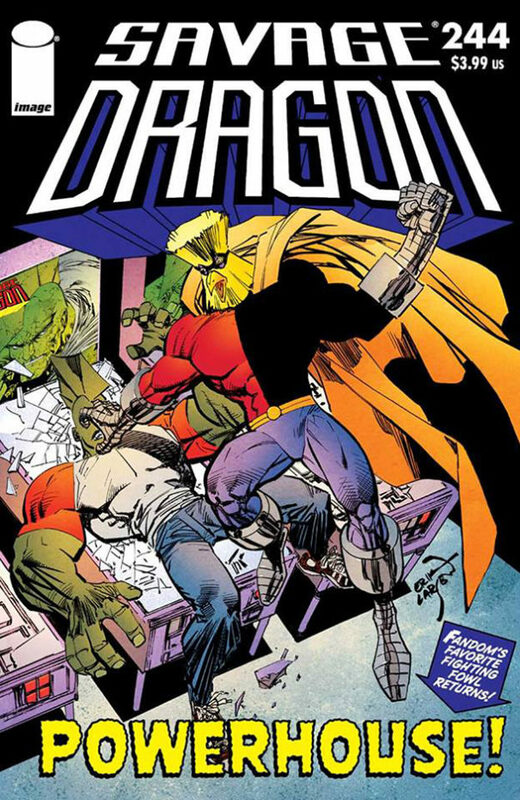 It came out shortly after Dragon had a hole blasted through him.